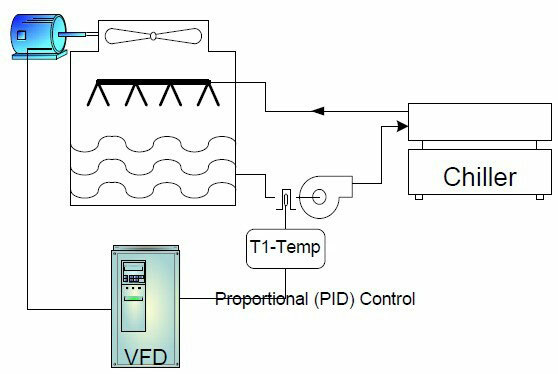 Frequency inverter adjusts the speed of the fan(s) on the cooling tower by sensing temperature by way of the built in controller (PID). Potential energy savings occur whenever the actual wet bulb temperature is lower than the design wet bulb. A cooling tower is designed to remove heat from water at a specific rate via evaporative cooling. It should deliver cooled water to the system that should never exceed the design temperature. Since cooling is due to evaporation, the wet bulb temperature of the air is important. The cooling tower is thus designed to provide cooled water at the desired temperature at the highest wet bulb temperature that the cooling tower will experience. Changes in the ambient wet bulb temperature causes the fan speed to be modulated and this reduces energy consumed by the fan(s) motor. The frequency inverter will run the fan at the lowest speed that will maintain the system output temperature. A temperature sensor located at the towers outlet (T1) provides the signal that varies with water temperature. The set point controller (built in the frequency inverter or external) provides proportional accurate control of the cooling tower outlet temperature further, increasing the energy savings. The relationship between power and speed of centrifugal fans is expressed in one of the affinity laws for motors. The power requirement of a fan varies as a cube of speed. The frequency inverter allows the cooling tower fan to run at the desired speed to meet the cooling demand. Typically the fan will run at 40-70% of full speed, thus saving 50% or more of the energy consumed by a fixed speed (constant volume) system. - Power consumption matches fan HP at all speeds at the most efficient point. Increased system performance, energy savings and reduced maintenance costs are major reasons to consider retrofitting constant speed fans on cooling towers with frequency inverters. 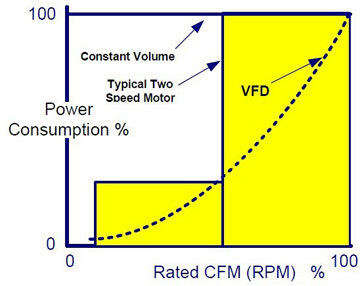 Existing motors may be used with a frequency inverter systems. Single and two-speed starters can be eliminated (a two-speed motor is permanently wired for high speed operation). Minimum speed of the frequency inverter can be set to 20 to 25% for direct connected or belt driven fans. When a gearbox is used, minimum speed is more of a concern. The gearbox may depend on an oil slinger for lubrication. The frequency inverter may be programmed to monitor the oil level & temperature of the gear box and increase speed to allow for more lubrication. The cooling tower manufacturer should be consulted for minimum speed recommendations. Consider vibration analysis on the fan and tower assembly. frequency inverter controlled cooling tower fans operate over many speeds compared to constant or two-speed systems  mechanical resonance may develop at certain speeds. If the vibration is large enough, vibration switches are often wired to shut down the tower. Resonance speeds, when identified, can be programmed to be ignored or locked out in the frequency inverter parameters, preventing vibration at these frequencies. frequency inverters are usually mounted away from the actual cooling tower, resulting in long lead lengths between the frequency inverter and the motor. For older motors, with lead lengths greater than 60 feet, a dV/dT (output) filter is recommended. Newer motors (usually approved for frequency inverter operation) may have lead lengths in excess of 300 feet, with out the need for a filter. Have the motor manufacturer advise you of the lead length and carrier frequency restrictions. Industry standard communication field bus such as LON,BACNET, PROFIBUS, MODBUS and JOHNSON N2 OPEN are standard options on many frequency inverter models. The communication options allow a management system to monitor data, energy usage, change frequency inverter parameters and remotely control the frequency inverter. To achieve the desired water temperature, a temperature sensor (transducer) measures the actual temperature and compares it to the desired temperature setpoint. The frequency inverter adjusts the speed accordingly. If the temperature is too high, the frequency inverter will increase the airflow. If the temperature is too low, the frequency inverter will decrease the air flow to reduce the cooling effect. The transducer/sensor is usually mounted on the outlet of the cooling tower. Mamac immersion type Model is recommended as it provides the sensing signal (0-10V DC or 4-20ma) to the frequency inverter. Start with a control proportional band of 10 degs F to minimize fan cycling. Set motor acceleration and deceleration time to 90 sec to allow for soft start benefits. Carrier frequency may need to be adjusted to reduce noise and vibration. Critical fan speed avoidance to avoid operation at the cooling tower resonant speeds. Can a 60Hz motor run on 50Hz power supply? How to select Frequency Converter?